I spent some time in early 2017 looking for a tough, scenic race to run on my 40th birthday, and after narrowing the choices down to a couple of options, I decided to go with the Ridge Off Roader which is run in the Chiltern Hills area of natural beauty. 2017 was the fifth running of the flagship 10k event, but this time it had been expanded to also include a half-marathon option, and while I was really tempted by the longer distance, I decided that on balance, the 10k would be the better option for me. However, I didn't fully commit to the 10k race and I kept my options open until the day the online entries closed, and with just 9 spaces remaining, I finally put my entry in via the Run Britain website. As an affiliated runner I paid the £14 entry fee, while unaffiliated runners paid £16. I got a confirmation email and then an email containing the race day instructions, which was really handy. 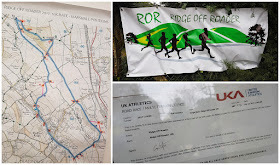 On the day of the race, I headed over to Bledlow Ridge in Buckinghamshire which is where the race is based. The forecast was not great and during the drive, the rain came down pretty heavy. We arrived and parked in the race car park which was in a grass field adjacent to The Boot pub, it was a little muddy in the field so I changed straight into my trail shoes before leaving the car. Little did I knew at this stage that the car was going to get stuck in the mud after the race - thankfully some of the marshals helped to get us out by giving us a big push - thank you. A five minute walk back down the main road eventually brought us out at Church Lane and Bledlow Ridge School, which was used as the race HQ. I went into the main hall to collect my race number, and while doing so, I was handed a birthday present from the organisers (I was one of three people running the race on their birthday). It was a really nice gesture which I really wasn't expecting, so thank you very much! 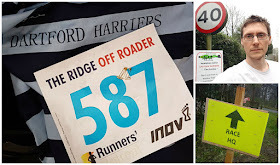 So with my number collected I watched as the half-marathon runners set off at 10am on their delightfully brutal 21km mission up, down and across the hilly Chilterns. This left me enough time to get changed into my shorts, have a little warm up and use the toilets, which were just outside the school in a car park - there were four portaloos and they seemed to handle the numbers pretty well. In addition to the half-marathon and the 10k race, there were two children's races, a 1k and a 2k. I asked my daughter if she wanted to take part, but she's not really into regular running at the moment as she prefers obstacle course races. So after cheering the 2k runners on, and the time being 11.02am (that was the official race start time) the 10k race was finally ready to begin. We took up our places in Church Lane and once the children were all safely well clear of the route, we were sent on our way. The opening section took place on the roads around Bledlow Ridge which were briefly closed to traffic to allow us to pass through safely and it was just over 1km before the first off-road section was reached. I took it nice and easy along here because I didn't want to burn myself out before the hard bits of the race! The first bit of mud was a bit of a shock to the system after settling into a nice steady pace on the road, but it didn't take long to find my cross-country legs and I flew down the steep off-road decline along the edge of a field. After about 500 metres, we were sent back out onto a road (Slough Lane) where we had the first climb. While it was challenging, I had no idea at this stage that this would be the easiest hill of the race! Anyway, I passed a few runners on my way up and finally at the 2.3km point we reached the proper off-road part of the course where the first hill continued but diagonally across a field. About a mile of downhill and flat running followed but underfoot conditions did not make this easy - sometimes there was a little worn dirt path and others it was patchy clumps of grass to run on. Either way, a keen eye was required to avoid turning an ankle. The problem I was having at this is stage was that the light rain had covered my glasses and I could see clearly. Even so, I pushed on and overtook another runner. I should mention here that there were plenty of fab marshals out on the course, all very cheery despite the rainy conditions. At the 4.3km point of the race, the next incline started. Underfoot was muddy and slippery and this added to the challenge. It was tough but runnable for a while and I hit the halfway point in just over 22 minutes. Almost immediately after passing the 5km marker, the hill got steeper. I continued to run at first, but soon realised that I had to slow down and walk for about 200 metres. 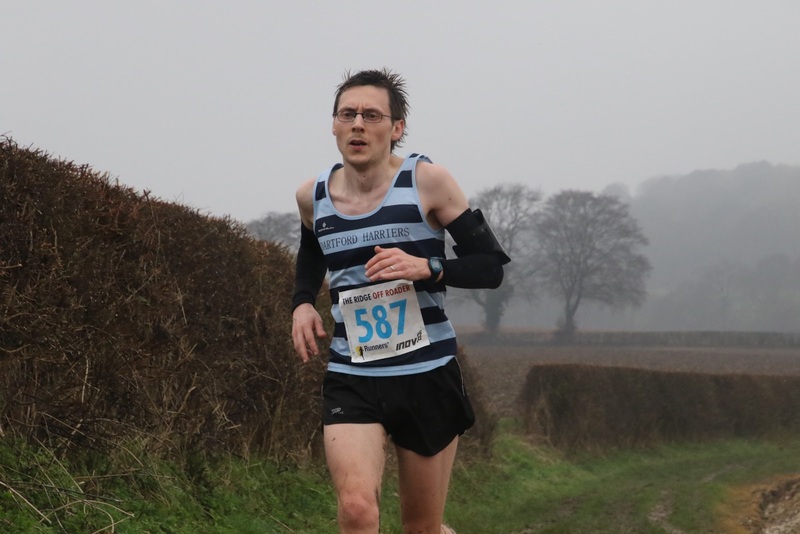 While I was walking, I took the opportunity to clean my glasses with my Dartford Harriers singlet - not the ideal material for cleaning the lenses, but it was better than nothing. I had been closing in on another runner up until this point, and although he also walked, he managed to get running again before me and I never did manage to reel him back him in. The top of this ridge gave fantastic views in both directions and it momentarily took my mind off the pain I could feel in my legs and lungs. I was back running at this point and continued to pick up speed as I ran down a very steep and technical section through some woodland. At 6.4km there was a water station. Also the 10k route and the half-marathon route met up here and there were a few more runners to interact with for the rest of the race - some were running at a pretty decent pace considering they had run eleven kilometres more than me at this point. 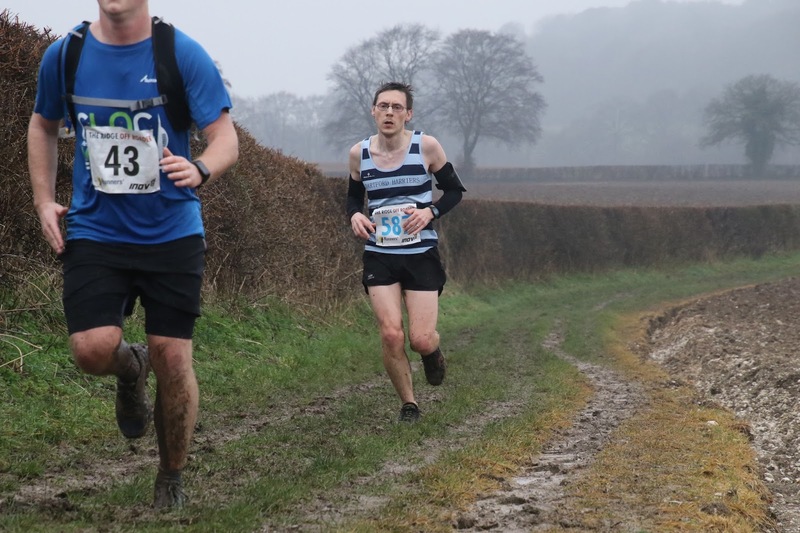 I ran alongside a half marathon runner (identifiable by the black bib number, the 10k runners had blue numbers on our bibs) as we flew along a wooded section which was ever so slightly downhill - this was a lot of fun, but there were tree roots and branches to look out for. At 8km, there was a photographer from oxonraces.com on the course and he got a couple of nice shots of me - the photos were offered to runners for free and this was one of the factors that swung me towards entering this particular race - so I'd like to add a special thank you Barry Cornelius for them. By the time I had reached the 8.3km point, I was feeling good, but there was another climb looming. After a very short section on tarmac we turned into another muddy field and continued to plod away uphill - I was assured by a marshall that this was the last hill. There was a brief respite from the climbing as I hurtled downhill for about 100 metres or so, but then it was back to climbing. For the second time in this race I was reduced to walking, as was everyone else around me. At the top I managed to get my legs moving again, but it was very muddy and I splattered my way through it as I passed along next to the field where we had parked the car. Then, with one kilometre left to go, the course changed back to tarmac and I could finally pick up the pace again. Hurtling down the pavement towards the school, I remember the road from my walk earlier that morning. 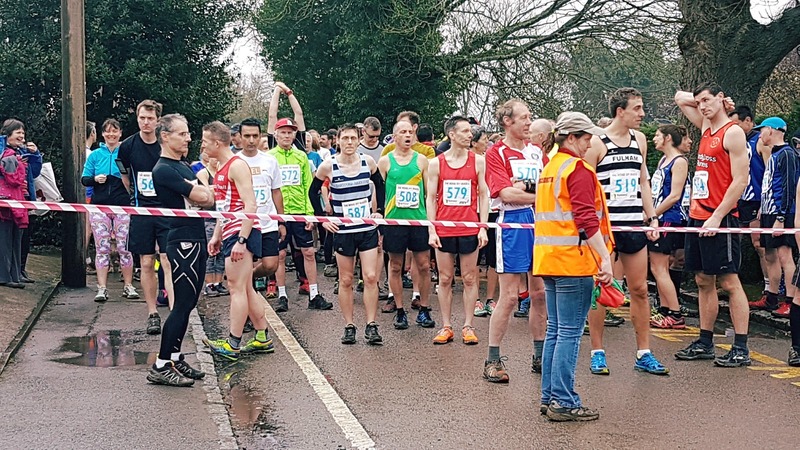 A marshal soon directed me back into Church Lane and another pointed into the school grounds where there was one final but of slightly muddy grass to run on which looped round to the finish line! I grabbed a quick hug from my daughter who I had seen running towards the finish line from across the school field and the race director wished me a happy birthday over the loudspeaker system, which was another really nice gesture and really made my day. I had a medal and a couple of goody bags handed to me and I found my wife who had managed to take a few photos of me as I came hurtling back into the finish area - again, thank you! The results were published later that day and I had finished in 9th position out of 185 runners in the 10k event, which I was very happy with. To give you an idea of how tough the course was, in my current shape, I would expect to run a flat, road 10k in under 41 minutes. My official time for this race was 46.59 so that's roughly six minutes extra, which was fine because this race was never about going for a quick time. It was all about running in a beautiful location and having a lot of fun (in the mud) in the process, both of which I can confirm were successful!